The melody and lyrics of "Buzzcut Season" by New Zealand singer-songwriter Lorde (aka Ella Maria Lani Yelich-O'Connor) got under my skin and have been stuck in my head for weeks. Total Ohrwurm! Not taking it too literally, the atmosphere and words resonate with my just slightly surreal experience of living isolated from my previous home, friends and family with my beloved husband in Colorado. It's beautiful and wonderful and yet a bit unreal - especially with everything that has suddenly disappeared from my life, like my friends, big city atmosphere and a certain edginess and darkness. Living in a hologram? Hyper-real? 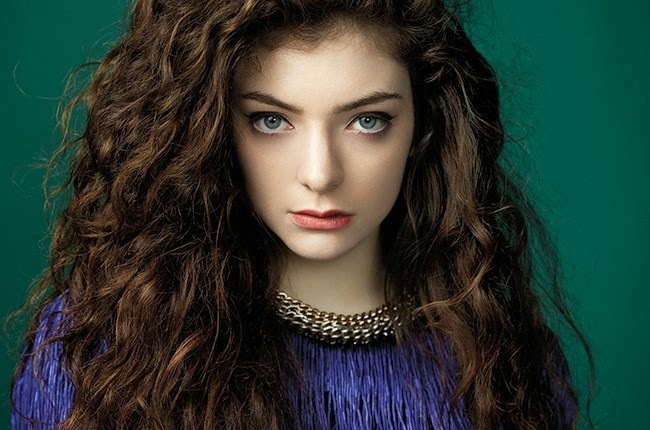 After already being hooked on this song, I discovered Lorde's big hit: "Royals"
That one has stirred up quite some controversy because a lot of Americans consider the lyrics to be racist. Lorde does express in the song that she's not interested in material things, status symbols and antics mostly associated with American Hip Hop culture. What strikes me then is the immediate association people have between cultural aspects/preferences of a subculture and race. I believe those are two completely different things. Just because someone doesn't like flaunting hip hop accessories doesn't mean that they think lesser of black people. I'm always fascinated when Americans' paranoid attempt at political correctness overcompensates and actually reveals a strangely racist stand by seemingly saying "pointing out differences of culture is bad" as if it would remind us that we are different races and being of different races is bad. Culture and race are not the same thing! Being of a certain race is not a bad thing! And culture comes in large part down to taste and what you do - not as "what" you were born. People of different cultures, backgrounds, races, religions are and should be different. We're not all the same. We don't have to be. It's beautiful that we're all different. Lets celebrate that! Nobody is better and nobody is lesser and not everyone fits the general stereotype of their race, culture, nationality, gender or age or whatever. I've known some black punk rockers and goth kids in my day. There are a lot of white rappers, obviously. And there are plenty of black people who don't like hip hop and plenty of hip hop people who don't have diamonds on their timepieces. So Lorde wanted to express she's not into flaunting status symbols and mentions mostly those associated with hip hop culture. What's so wrong with expressing that she isn't that much into materialism? She's got her own taste, they have theirs. Neither is better than the other. I personally think materialistic status symbols in general are stupid and I happen to not like many things associated with hip hop and R&B culture, either, but I like hip hop - so wonderfully beat-driven! And I really like the song "Royals" because it has a killer beat, too.